On 27th September, 1918, north of Canbrai, France, Lieutenant Lyall led his platoon in the capture of an enemy strong point, including 13 prisoners, a field gun and four machine-guns. Later he led his men once more against another strong point, rushing forward alone and capturing the position single-handed, on this occasion taking 45 prisoners and five machine guns. Another 47 prisoners were captured in his final objective along with another five machine guns. Near Blecourt, France, on the 1st October 1918 the capture of a strongly defended position yielded 60 prisoners and 17 machine-guns. 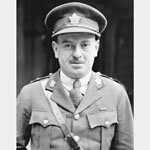 During all of these operations, once the objective had been attained, Lieutenant Lyall, still under heavy fire, tended to the wounded. The record which contain details Graham Thomson Lyall in Lodge of Harmony and Industry No. 381 is not yet accessible.